Now walkers can enjoy one of the UK's longest fully-waymarked footpaths, loosely following the line, from Shropshire to Carmarthenshire. The last stage of the 141-mile (226km) trail will be opened on Thursday. One tourism expert said Wales was "ideal" for such walking tourism due to its nature and heritage. And the predicted rise in visitor numbers is expected to provide a "major boost" to the local economy. It has taken more than two years to complete since the plans for the trail were first unveiled. The final stage, which will be opened in Llandrindod Wells, was designed by former tourism development professor Les Lumsden. He said: "Wales is ideal for this type of tourism because one of its greatest assets is its diversity of countryside in close proximity. "Combined with heritage railways such as this, Wales has the potential to be like Switzerland in attracting walker visitors. "Previous research shows these trails are major generators of revenue for places that otherwise wouldn't get the visitor-spend." Heart of Wales Community Rail Partnership said: "With large numbers of visitors planning to walk the trail this summer, we are keen to put local cafes and pubs, family farmed produce and 'off the beaten track' B&Bs at the centre of the walking trail experience." Starting at the train station in Craven Arms, the trail sets out on a journey south west to Llanelli. Skirting the Brecon Beacons, it crosses mountains, valleys, woodland and wetlands offering an ever-changing view of the Welsh countryside. 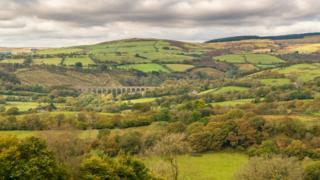 The railway line, first laid in the 1860s as the Central Wales Line, has survived the threat of closure, dwindling passenger numbers and even tragedy, when four people died in a bridge collapse. Walkers can now hop on and off at all 29 stations. Among the small businesses to have already benefitted is Basel Cottage Holidays, near Llandovery. Owner Sue MacGill said: "It's a very innovative idea and great for a rural area to have something else for guests to enjoy or even attract more visitors." The potential value to the local economy has been recognised by local authorities. Powys council deputy leader Aled Davies said: "This project is providing real benefits for the people of Powys and the visitors it will attract to the area. "With hidden gems around every corner, it won't fail to impress." It has taken three years to complete the final and longest stage through Powys amid neglected paths, difficult terrain and cash-strapped councils. But volunteers in Powys raised almost £20,000 and Ramblers Cymru said visitor numbers were already rising. Alan Austin, chair of Powys Ramblers, said: "The idea of setting up a trail that encourages walkers to use the train rather than their cars is a brilliant one. "We are delighted that Powys council, which is seriously strapped for resources in these times, has supported the trail with manpower and other resources. "Already there is a noticeable increase in walkers interested in following sections or the whole route."